Dendy is an eight-bit tvset console, a clone of the japane Nintendo Entertainment System. It is connected to the TV-set usually with coaxial cable, after which the video signal is tuned up on one of the channels. Applications launche by means of removable cartridges that in fact represents the circuit board with chip ROM, storing the application code. Actually, I’ve never been a gamer, and moreover, I have never had a game console. I do not know why, but I can’t play video games for a long time and never could – it just becomes boring for me. However, there are rare exceptions among the games that can and hold my attention on them. 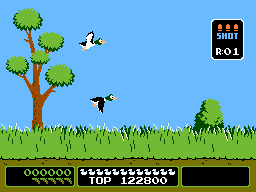 One of such games was Duck Hunt for Dendy. As addition to the user interface controllers like joystick console was provided with a gun so you could shoot different targets on the display. It was not clear for me how the gun determines that there is a certain target aimed by its optical sensor. As a response to this misuderstanding all my friends (far from electronics and software concept) were confused as well, but for another reason. They misunderstood, what exactly are you unclear with? – Here is the eye , its looking at the TV diplsay , there is flying duck, push the hook, the eye sees that you got a duck … Naive simplicity . My friends did not bother with the fact that, in order to determine whether the eye of the gun has got the duck or not , you need a complex mechanism of image recognition, it’s all obvious for them. At the moment of pressing the trigger the TV screen goes black, and the areas over the targets become ​​white. This recognition algorithm is much easier)) In fact, it is possible to shoot a white sheet of paper, and you will always hit the target.